After England's devastating defeat to Croatia, we've rated every player, the manager and the tactics. You should know it by now. Even the RAF knew it in advance. 3-5-2. England allowed Croatia's midfield trio into the space in front of the defence too much after Kieran Trippier's early goal. They also shifted back to a 5-3-2 after conceding and allowed too much space on the flanks. Henderson looked isolated at times, and needed more support from Alli and Lingard. Gareth Southgate could not have done much more. Retained faith in his starting XI and made four changes that could well have influenced the match. Southgate seemed to calm his team down at the final whistle when their composure had gone to pieces. The first half of extra-time was an improvement, but there is not much the manager can do about tired legs and inexperience. And we'll always have The Waistcoat. Jordan Pickford - 7: Not at fault for either goal and made a sensational save in extra-time from Mandzukic, which kept England in it. Not his usual excellent distribution but that is nit-picking. Kieran Trippier - 8. Joins Bobby Charlton and Gary Lineker as the only England players to score in a World Cup semi-final. His sublime 5th minute free-kick was his first strike for his country too. Was sloppy late on but was clearly struggling and it was heartbreaking to see him go off injured. Kyle Walker - 6: Used his pace to bail his side out on a few occasions but was at fault for the Perisic goal - after not going to meet the ball in the air - and picked up a silly booking for holding on to the ball after a foul. Needs more time at centre-back. John Stones - 5: Confidence seem to evaporate once Croatia scored. Having been so assured against Sweden he was indecisive and gave the ball away with poor clearances. Nearly scored again with a top header but was slow to react to the through ball which led to the killer goal. Harry Maguire - 7: 'Slab Head' was a bit careless when holding Dejan Lovren in the box just before half-time as a cross came in, with the VAR review going England's way. Was flustered with his defensive colleagues when it went to 1-1. However, he continued to carry the ball forward bravely and can only improve. Ashley Young - 5: Seemed to tire quickly and allowed Croatia time and space down the left as the game wore on. Rightly substituted. Place is now under threat from Danny Rose, despite dead-ball capabilities. Jesse Lingard - 6: Weak shot in the 37th minute was unlike him. His intelligent movement in and around the box caused problems for Croatia but looked absolutely exhausted by the end. One match too far. Jordan Henderson - 7: Tried manfully to hold it all together in midfield against a top-class opposition. But became overwhelmed and needed more support from the two men either side of him. Dele Alli - 6: Seemed much more settled in the first half but then went increasingly long spells without being involved in anything meaningful. Raheem Sterling - 8: Stretched the defence, and worked the channels to allow Kane space in the middle in the first half. Was unlucky to be subbed off to make way for fresh legs as Kane was clearly struggling more than him. Just needs that goal and his England career could hit another level. Harry Kane - 6: Tame effort in the 30th minute, then hit the post from the follow-up, which was so unlike the usually deadly Tottenham striker. Became increasingly absent in what was his worst game of the tournament by some distance. Seemed like he may not have been 100 per cent fit. Danny Rose - 6: Was an improvement on Young - especially going forward - when he came on but could not find incisive pass or good enough cross for a goal. 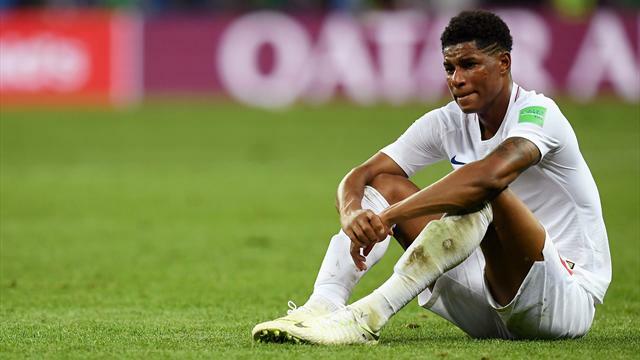 Marcus Rashford - 6: Didn't stop running but could barely get into the game as Croatia played keep-ball in midfield. Eric Dier - 6: Brought some much needed composure but could not launch any dangerous attacks or create any chances from deep.